Premiere: Marco Polo f/ Talib Kweli & DJ Premier "G.U.R.U." Friday Apr. 19 will mark the three-year anniversary of Guru, the legendary MC and member of Gang Starr along with DJ Premier. 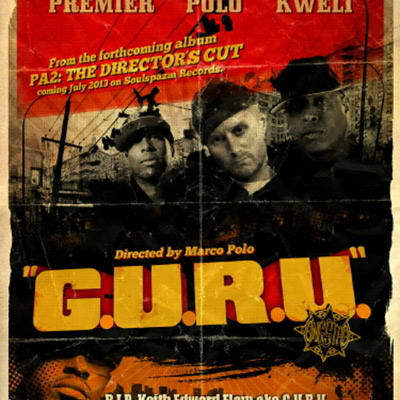 Marco Polo teamed up with Premier and Talib Kweli for "G.U.R.U." which is dedicated to Guru&apos;s memory and legacy. The track will be the lead single from Marco polo&apos;s upcoming PA2: The Director&apos;s Cutwhich drops in July and will feature Organized Konfusion, Gangrene, Talib Kweli, DJ Premier, Masta Ace, Posdnuos Large Professor and more.